The ancient city of Herat in western Afghanistan turned 3000 years old on April 14, 2015. About 5.000 Herati people gathered at the Herat Citadel to celebrate their history, arts, and literature with traditional dances, songs, and local food. The Heratis named it Unity Day and asked the government to include the date in our national calendar. Herat is very important to Afghanistan and the region for its location along the ancient Silk Road, as well as its weather, fertile soil, and as the birthplace of many famous poets and writers. Many schools and places are named after women poets and writers such as Mehri Heravi, Goharshad Begum, Nadia Anjuman, and male writers such as Amir Ali Shir Navai, Jami, and Khaja Abdullah Ansari, who lived in Herat. Women sometimes picnic with their female friends or relatives at the shrines and tombs. The old Silk Road, which connects Asia to Europe, attracted many merchants and conquerors throughout history. Remains of the civilization of Persians, Turks, and Greeks still exist. The city was once walled; it was destroyed twice by the Mongols and again by Genghis Khan. In the fifteenth century Herat was reconstructed as the capital of Central Asia. Before that Shams al-Din Kart ruled Herat in 1244 during a period of literacy and art in which Herat became known as the pearl of Khorasan. The most remarkable woman in the history of Herat lived in the 15th century. Goharshad Begum was the wife of Shah Rukh, Emperor of the Timurid Empire. She was passionate about art and literature and she was a great political advisor. During her time, the Musallah Complex, more than twenty minarets and some schools were built. Five of the minarets survive today, but are not in good shape. There is also a park on the site of her Musallah, or Women’s Garden, called Baqi Zanana. Four of the minarets are located opposite of the Women’s Garden. I was told that the minarets were once covered in a delicate blue mosaic framed in white and set with flowers, but the wars destroyed the mosaics. One of the minarets has a big hole in it and it feels like it may fall anytime. UNESCO has been looking for ways to protect this minaret. The five minarets mean a lot to me. I looked at them every morning from our home and they made the sunset prettier. They remind me of resistance— they witnessed my beautiful hometown go through many hardships. There are two other well-known historical sites—Citadel of Alexander and the Friday Mosque. Herat’s features have changed during the last fifteen years. Tall concrete buildings are replacing the small mud shops and homes. People are becoming more competitive and want to show off. Each house has a guest room and they use the best decorations for it. People used to have their kitchens outside, mostly because they had to build fire to cook. We still wash and dry our clothes in the yard; in the summer we eat breakfast and dinner in the yard and some nights we sleep outside. The bath is in the corner of the yard—we all have tall walls around our houses. Traditionally, sons live at the same house with their parents after they get married. Like the rest of the Muslim world, we celebrate the major holidays of Eid al-Fitr and Eid al-Adha for three days with new clothes, the best foods, and visits with relatives and friends. We share sweets and fruits with them. We also celebrate our Nowruz, the first day of spring, and we go to the gardens and parks. Herat people like big weddings where they invite hundreds of people. People still do the group stick dance called chopbazi. Herat people use a lot of proverbs in their daily conversations and the people of Herat are very hospitable. They welcome guests with naan bread and tea. Herati women taught me about strength and patience. I will never forget their smiling faces and warm hospitality. Herat is famous for its grapes. There are fifty-two kinds of grapes in Herat and they are exported to other countries. Herat was once famous for its wine, but we are not allowed to produce wine any more. Herat’s river, or Haryrud, which means silken water, helps Herat to stay green. Herat is famous for its fresh water springs and more than half the population of Herat city has gardens. In the villages, people grow wheat and vegetables and have fruit trees. The villagers come very early in the morning to sell their vegetables and dairy products in the city, and men often do the shopping. People buy and eat what is in season. Herat is a center of business because it borders Iran and Turkmenistan. We export carpets, nuts, fruits, and dried fruits and import production and raw materials. 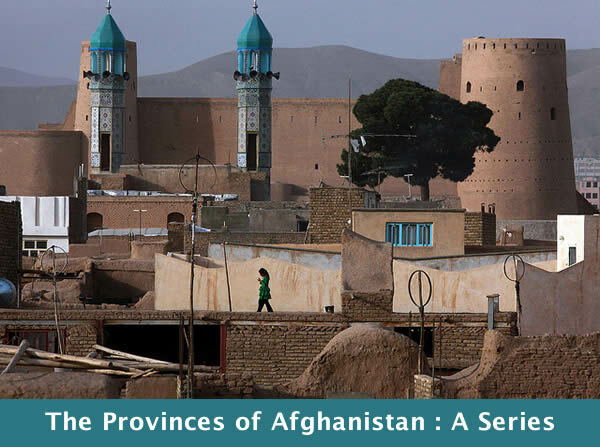 Although Herat is famous for literature and art, people of Herat are resistant and conservative when comes to protecting their land and women. Herat lost two million people in the fight against the Soviets—the period known as the 1979 Herat uprising. A common sight in Herat is a woman seated behind men on motorbikes and this often surprises visitors from other Afghan cities. Because Herat is close to Iran, we adopt some customs from Iran. One thing that I don’t like about my home town is the way everyone minds everyone else’s business. There is a lot of gossiping. People want to know everything about how a young woman lives her life, what she wears, and where she goes. If a young couple walks on the streets together, people ask if they are related, and sometimes they even call the police. People think that they are responsible for all the girls and women. Sometimes a Herati woman’s future will depend on where she lives. If she is lucky enough to live in an upper-class area with educated people, she will be able to get a good education and take courses to learn English or prepare for college and people won’t mind her coming and going from the house. Girls in villages have fewer opportunities and many marry by age sixteen. They usually have many children and spend their time caring for their families and their animals.